Imhotep (sometimes spelled Immutef, Im-hotep, or Ii-em-Hotep, Egyptian ii-m-ḥtp *jā-im-ḥatāp meaning "the one who comes in peace"), an Egyptian polymath, served under the Third Dynasty king Djoser (reigned ca. 2630-2610 B.C.E.) as chancellor to the Pharaoh and high priest of the creator god Ptah at Heliopolis. His excellence in practical scholarship has led to the preservation of his reputation as a preeminent architect and physician—arguably the earliest practitioner of each discipline known by name in human history. In the centuries following his life, he came to be identified as a son of Ptah and a god of medicine. This led to the gradual development of a religious cult, which reached its zenith during the Hellenistic period, when Imhotep was identified with the Greek god, Asclepius. As an Egyptian culture hero/deity, Imhotep belonged to a religious, mythological and cosmological belief system that developed in the Nile river basin from earliest prehistory to around 525 B.C.E. Indeed, it was during this relatively late period in Egyptian cultural development, a time when they first felt their beliefs threatened by foreigners, that many of their myths, legends and religious beliefs were first recorded. The cults were generally fairly localized phenomena, with different deities having the place of honor in different communities. Yet, the Egyptian gods (unlike those in many other pantheons) were relatively ill-defined. As Frankfort notes, “If we compare two of [the Egyptian gods] … we find, not two personages, but two sets of functions and emblems. … The hymns and prayers addressed to these gods differ only in the epithets and attributes used. There is no hint that the hymns were addressed to individuals differing in character.” One reason for this was the undeniable fact that the Egyptian gods were seen as utterly immanent—they represented (and were continuous with) particular, discrete elements of the natural world. Thus, those Egyptian gods who did develop characters and mythologies were generally quite portable, as they could retain their discrete forms without interfering with the various cults already in practice elsewhere. Furthermore, this flexibility was what permitted the development of multipartite cults (i.e. the cult of Amun-Re, which unified the domains of Amun and Re), as the spheres of influence of these various deities were often complimentary. The worldview engendered by ancient Egyptian religion was uniquely defined by the geographical and calendrical realities of its believers' lives. The Egyptians viewed both history and cosmology as being well ordered, cyclical and dependable. As a result, all changes were interpreted as either inconsequential deviations from the cosmic plan or cyclical transformations required by it. Breasted argues that one source of this cyclical timeline was the dependable yearly fluctuations of the Nile. The major result of this perspective, in terms of the religious imagination, was to reduce the relevance of the present, as the entirety of history (when conceived of cyclically) was defined during the creation of the cosmos. The only other aporia in such an understanding is death, which seems to present a radical break with continuity. To maintain the integrity of this worldview, an intricate system of practices and beliefs (including the extensive mythic geographies of the afterlife, texts providing moral guidance (for this life and the next) and rituals designed to facilitate the transportation into the afterlife) was developed, whose primary purpose was to emphasize the unending continuation of existence. Given these two cultural foci, it is understandable that the tales recorded within this mythological corpus tended to be either creation accounts or depictions of the world of the dead, with a particular focus on the relationship between the gods and their human constituents. As is often the case for individuals whose historical existence was sufficiently remote, little is definitively known about the life of Imhotep, an Egyptian culture hero from the Third Dynasty period. Fortunately, the surviving complex of scribal records, artistic depictions, and mythic accounts paints a relatively consistent picture of the man, allowing us to draw up the following biographical sketch. 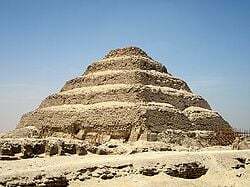 In the Djoser complex, the architect Imhotep apparently united basic elements found in the royal funerary architecture of Abydos with the traditions of Memphis. The royal Abydene tomb may be reflected in the south tomb; the Memphite tomb, in the north tomb under the stepped pyramid. ... Perhaps later builders believed Imhotep's large-scale architectural model was too much of a pastiche to warrant further development. In any event, the funerary complexes of the short-lived successors of King Djoser were greatly simplified and consisted of paneled enclosures that omitted all the interior buildings except the stepped pyramid and the southern tomb" (43-44). He was also recognized for his contributions to Egyptian literature, to the extent that he was "mentioned in a Middle Kingdom text as one of the sages whose memory lives through their writings." In another example of this characterization, Breasted quotes an Old Kingdom-era funerary song that states: "I have heard the words of Imhotep." Likewise, Harold Scheub states that Imhotep was the first recorded author of an "Instruction" text (a common Egyptian literary genre providing epigrammatic advice for leading a good life) His association with written culture is also evidenced by iconographic depictions, which portray him with as a studious man with a scribal papyrus in his lap. The range of this remarkable man's achievements is evidenced by a Third Dynasty stele, which comprises a list of royally-sanctioned titles, including "Chancellor of the King of Lower Egypt; First after the King of Upper Egypt; Administrator of the Great Palace; Hereditary nobleman; High Priest of Heliopolis; Builder; Chief Carpenter; Chief Sculptor and Maker of Vases in Chief." Either during his lifetime (or in the centuries immediately following his death), Imhotep was also deemed to be the founder of Egyptian medicine. This suggestion was supported by his attributed authorship of a medical treatise remarkable for its abstention from magical thinking, the so-called Edwin Smith Papyrus, which provided detailed anatomical observations, and a catalog of ailments and cures. The surviving papyrus was probably written around 1700 B.C.E., though it could easily have been a copy of a text (or texts) that were a thousand years older. This attribution is speculative, but it is consistent with classical Egyptian characterization of Imhotep. As Wilkinson notes, "although his medical achievements are not contemporaneously documented, the fact that Imhotep became known as a virtual medical demigod within a century or so of his death seems to indicate that he may well have been a highly skilled physician." In the centuries following the death of the great scholar and architect, Imhotep came to be venerated and, eventually, worshiped outright at shrines throughout the country. Just as the cult of the pharaohs was justified through the claim of divine provenance (usually credited to Horus or Ra), so too was the cult of Imhotep justified by claiming that Ptah, who the culture hero had served as a priest, was in fact his father. In mythological and historical texts, he is often paralleled with Amenhotep son of Hapu, another deified mortal who was renowned for his intellect and scholarship. However, Erman notes that "his cult still retained the forms of the worship of the dead" (unlike the purely religious deity cults of the official religion). The veneration of Imhotep grew to deification in the Late Period and the Greco-Roman era when his cult reached its zenith, and a number of shrines and temples were dedicated to the deified scholar. His main areas of worship appear to have been in the area of Saqqara, on the island of Philae, and at Thebes where he was also worshiped along with the deified 18th-dynasty sage Amenophis [Amenhotep] Son of Hapu at Deir el-Bahri and in the Ptolemaic temple at Deir al-Medina. An important inscription regarding him was placed in the temple of Ptah at Karnak in the reign of Tiberius. May its people see you with joy! Refresh your body with libation! One and all exalt your kindness! You renew your father's creation. An inscription from Upper Egypt, dating from the Ptolemaic period, mentions a famine of seven years during the time of Imhotep. According to the inscription, the reigning pharaoh, Djoser, had a dream in which the Nile god spoke to him. The king, realizing his predicament, asked for his loyal retainer's interpretation and acted upon his suggestions. Imhotep's success in his advisory role creates an obvious parallel between himself and the biblical hero Joseph, son of Jacob, a similarity that has long been commented upon. More recently, the Joseph parallels have led some alternative historians to actually identify Imhotep with Joseph, and to argue that the thousand years supposedly separating them are simply indicative of a faulty chronology. Further, various Hermetic texts concerned with both metaphysical truths and magical charms are credited to the inspiration of Imhotep (though typically in the syncretic guise of the Hellenistic Asclepius). This phenomenon of inspiration is described in one historical text from the period, where "the author describes how he found himself faced with the task of translating into Greek an Egyptian religious text concerned with the nature and worship of the god Imhotep, and how he felt overwhelmed by the enormity of trying to translate sacred traditions into the 'popular' language of the Greeks. He kept putting off the job; as a result he fell ill, and almost died. Only when the god himself, Imhotep, appeared in a vision ... was the man cured. But his cure had a price: he would have to honour his commitment and finish the translation." Commenting on these Hermetic documents, Pinch suggests that "the philosophical text known as the Asclepius is a dialogue between Imhotep/Asclepius and Thoth/Hermes about the secrets of the universe. Three thousand years after his death, Imhotep was still celebrated as the embodiment of Egyptian wisdom." ↑ 1.0 1.1 Dates courtesy of BBC History. Retrieved August 15, 2007. ↑ The numerous inscriptions, stelae and papyri that resulted from this sudden stress on historical posterity provide much of the evidence used by modern archeologists and Egyptologists to approach the ancient Egyptian tradition (Pinch, 31-32). ↑ 5.0 5.1 5.2 5.3 Henri Frankfort, Ancient Egyptian Religion (New York: Harper Torchbooks, 1961, ISBN 0061300772). ↑ 6.0 6.1 6.2 Françoise Dunand and Christiane Zivie-Coche, Gods and men in Egypt: 3000 B.C.E. to 395 C.E. (Ithaca, NY: Cornell University Press, 2004, ISBN 080144165X). ↑ Jan Assmann, In search for God in ancient Egypt (Ithica: Cornell University Press, 2001, ISBN 0801487293), 73-80. ↑ 8.0 8.1 James Henry Breasted, Development of religion and thought in ancient Egypt (Philadelphia: University of Pennsylvania Press, 1986, ISBN 0812210454) 8, 22-24. ↑ Barry J. Kemp, Ancient Egypt: The Anatomy of a Civilization (Routledge, 2005, ISBN 0415063469), 159. ↑ Byron E. Shafer, (ed. ), Temples of ancient Egypt (Ithaca, NY: Cornell University Press, 1997, ISBN 0801433991). ↑ 11.0 11.1 11.2 Geraldine Pinch, Handbook of Egyptian mythology (Santa Barbara, CA: ABC-CLIO, 2002, ISBN 1576072428), 148-149. ↑ Harold Scheub, "Review of African Oral Traditions and Literature," African Studies Review, Vol. 28, No. 2/3. (June-September, 1985), 1-72. ↑ 13.0 13.1 13.2 13.3 13.4 Richard H. Wilkinson, The Complete Gods and Goddesses of Ancient Egypt (London: Thames and Hudson, 2003, ISBN 0500051208). ↑ Jimmy Dunn, "Imhotep: Doctor, Architect, High Priest, Scribe and Vizier to King Djoser," a feature article for tour-egypt.net. Retrieved August 15, 2007. ↑ 15.0 15.1 Adolf Erman, A handbook of Egyptian religion (London: Archibald Constable, 1907), 173-174. ↑ Leonard Francis Peltier, Fractures: A History and Iconography of Their Treatment (Norman Publishing, 1990, ISBN 0930405161), 16. ↑ E. A. Wallis Budge, (trans. ), The gods of the Egyptians; or, Studies in Egyptian mythology.Vol. I (New York: Dover Publications, 1969), 524-525. ↑ William Osler, The Evolution of Modern Medicine (Kessinger Publishing, 2004, ISBN 1426400217), 12. ↑ Sally MacLendon, Ancient Egyptian Literature - Volume 3: The Late Period (Berkeley: University of California Press, 1973, ISBN 0520040201), 105-106. ↑ Jacques Vandier, La Famine dans l'Egypte ancienne (Ayer Publishing, 1979, ISBN 040512399X). ↑ Emmet Sweeney, The Genesis of Israel and Egypt: An Enquiry into the Origins of Egyptian & Hebrew History (London: Janus Publishing Company, 1997, ISBN 1857563506). ↑ Peter Kingsley, "Poimandres: The Etymology of the Name and the Origins of the Hermetica," Journal of the Warburg and Courtauld Institutes, Vol. 56. (1993), pp. 1-24. 21. Budge, E. A. Wallis (trans.). The Egyptian Book of the Dead. 1895. Retrieved June 11, 2008. Budge, E. A. Wallis (trans.). The Egyptian Heaven and Hell. 1905. Retrieved June 11, 2008. Budge, E. A. Wallis (trans.). The gods of the Egyptians; or, Studies in Egyptian mythology. A Study in Two Volumes. New York: Dover Publications, 1969. Budge, E. A. Wallis (trans.). Legends of the Gods: The Egyptian texts. Retrieved June 11, 2008. Budge, E. A. Wallis (trans.). The Rosetta Stone. 1893, 1905. Retrieved June 11, 2008. Dennis, James Teackle (trans.). The Burden of Isis. 1910. Retrieved June 11, 2008. Griffith, F. Ll. and Herbert Thompson (trans.). The Leyden Papyrus. 1904. Retrieved June 11, 2008. Mercer, Samuel A. B. (trans.). The Pyramid Texts. 1952. Retrieved June 11, 2008. This page was last modified on 29 August 2014, at 23:41.